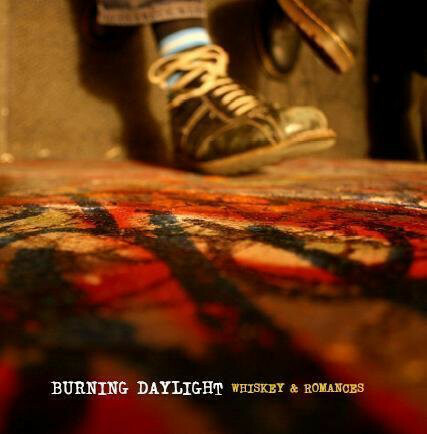 In 2007, I made my first record with my old band Burning Daylight. We were recording with Dan McLoughlin, bassist for one of my favorite bands (The Push Stars) and a celebrated producer and engineer in his own right. It was an exciting time. My first experience in a real studio, a full week of recording and mixing in the big city (ok, Hoboken, NJ, but that's pretty close to THE big city). It was a thrill for me to get to dedicate an entire week to my songs and to making them sound as good as they possibly could with Dan and my bandmates. It was a legitimizing moment for me as an artist to finally make a record and it was the culmination of around 5 years of writing and performing. But caught up in the excitement, I was also plagued by a lot of questions, most of them beginning with "what if". It's my firm belief that there isn't a musician/artist alive who hasn't had a "what if" experience in their career. "What if" this is my big break? "What if' this is the greatest record ever made and we don't even realize it yet? "What if" a giant record label somehow hears this and we're playing on Letterman next month? Well, this was my first "what if" moment. I wasn't completely delusional, just eager and naive (ok, really naive). I had some songs I felt pretty good about, a great producer and a decent recording budget. This just HAS to lead to bigger things, right? A manager, a booking agent, a label deal, a publishing deal. Maybe these strings on my guitar will be in the Rock & Roll Hall Of Fame someday...I better save them. But wait. What about the negative "what if" questions? Maybe it''s all a big waste and I'm kidding myself (I am a self-loathing musician, after all). Maybe this is my crowning achievement and it'll become a distant memory within a few years. Perhaps sensing the volleying going on in my head, Dan casually mentioned one day that this record might be a "slow burner". It might not make a big splash, might not land us a record deal, but these were good songs and solid performances and maybe, just maybe, people would notice...eventually. At first, this left me feeling a bit deflated. "I wanna be on Conan next week, damnit!" But we continued discussing the idea for a while and I started to realize that it actually wouldn't be such a bad thing. Sure, I didn't want to lose money on the album and I wanted people to hear it...but realistically, the possibility of this album "blowing up" was very slim. I didn't have a publicist. I didn't have a label. I had a MySpace...but we all know how that turned out. Then Dan said something to me that I have forever remembered and romanticized. Dan said, "Hey, maybe in 50 years, some kid will find this album somewhere and be inspired by it and he or she will pick up a guitar and start the next Beatles or Nirvana." Or maybe not. But maybe...just maybe. In the long run, that sounded a lot more appealing than a desperate (and likely futile) fight to get that label deal or manager that I THOUGHT I always wanted. I wrote all of those songs in various tiny apartments in college and in the years that followed for no other reason than I HAD to. I wasn't looking to score a publishing deal in Nashville or to get on MTV. I had an old Yamaha acoustic guitar that I got when I was 16 and I had songs in my head...so I wrote them. And I loved it. Every single minute of it. All these years later, I'm still writing songs and making records, just not with a band. If the last few years of consistent touring as a solo act have proven anything to myself, it's that I was born to be an itinerant troubadour. I have my guitar and my songs and I'm gonna sing them for people. That's it. I've (pretty much) retired from the "what if" game. To me, those "what ifs" are just distractions. They take my eyes off of the prize, and the prize is writing the best songs I possibly can and getting to play them for folks all over the country. If other cool stuff happens, that's great. I'll always be trying to get my music to as many sets of ears as possible but keeping my focus to what I can control is a kind of self-preservation that I can ill afford to let go of. So yeah, 8 years later, that record still hasn't shot up the charts and/or inspired the next Lennon/Cobain...but that's ok. I'm just fine with having that record and my subsequent solo records being "slow burners". Maybe my career as a whole will be a "slow burner", but hey, I'm still gonna cherish every second of it. "Slow & steady wins the race", my Grandma used to say...but I'm not in a race, I'm in a life.